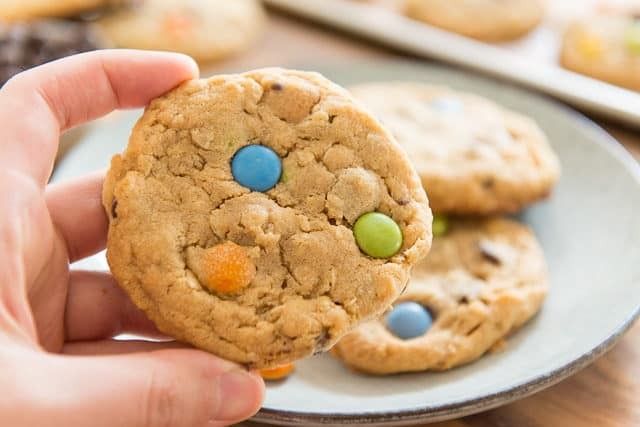 Monster Cookies combine many of the best cookies into one! They’re soft and chewy, with peanut butter, oatmeal, milk chocolate candies, and chocolate chips for a delicious treat. If you’ve ever wanted “everything” in one cookie, then Monster cookies are for you. The texture has bits of everything you could want: crisp on the edges, but a bit chewy as your teeth sink into it, plus bits of oatmeal for a hearty bite, and melty chocolate candies. And then the flavor: there’s creamy peanut butter, the subtle flavor of molasses from the brown sugar, some hints of chocolate chip cookie with two kinds of chocolate, and slightly sweet oatmeal. You’d think it’d be too “busy” for all of that to be going on, but it’s not. It all works to create something that I view as an ultimate cookie. 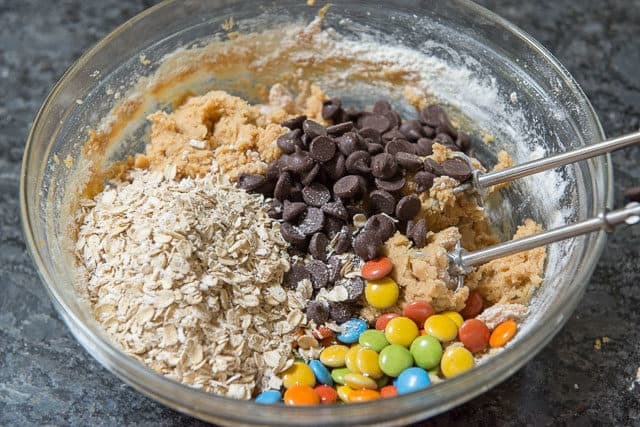 The beauty of a monster cookie is you can do different types of mix-ins for it. In the past I’ve done toffee bits, peanut butter chips, raisins, cranberries, and nuts. You can play with it to suit your tastes, or what you happen to have in your pantry. One more thing I want to mention is that this recipe has been updated from when I originally published it in 2011. After several batches of testing, the most drastic change was decreasing the amount of oats and adding a small amount of flour to ultimately give it a more standard cookie texture, like that of a chocolate chip cookie. You still get the oats in each bite, but I think this updated recipe is much better than the original. But the original, which is flour and gluten-free, is still pasted at the bottom if you prefer that. Using brown sugar in addition to the regular will give the cookie a slightly chewy texture that is heavenly! You can do other mix-ins here too, like nuts, dried fruits, toffee bits, and more. Also, for the oats, you want to make sure you’re using quick oats or slightly cut up old fashioned oats. Quick oats are better, but I usually only keep old-fashioned on hand. Simple pulse them in a food processor a few times to break them down slightly. 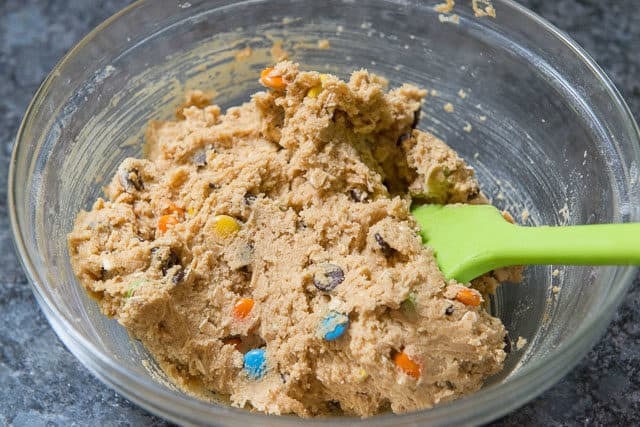 If you want to freeze your monster cookies: Freeze the scoops of cookie dough for up to two months. When ready to bake, bake straight from frozen at the same temperature, but adding a few minutes to baking time. It’s only for the sake of looks, if you want to have whole pieces of candy on the outside, but it’s not necessary otherwise. Bake the cookies until they’re slightly golden on the edges, but soft in the middle, about 11 minutes. 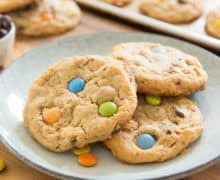 Monster Cookies will last for about 3 days at room temperature, or you can freeze them after they’ve been baked, for up to 2 months. 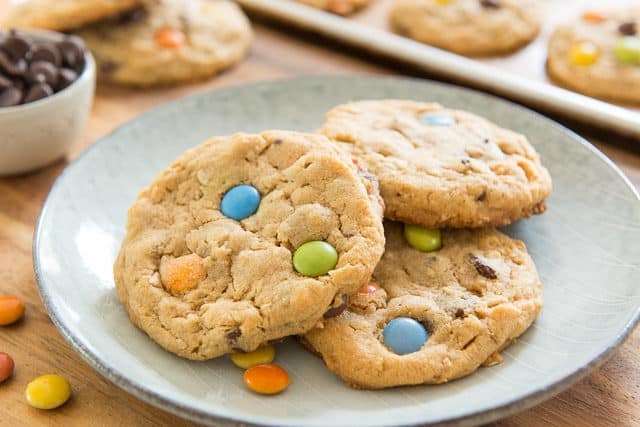 Similar cookies I love are these Peanut Butter M&M Cookies, Potato Chip Chocolate Chip Cookies, and White & Dark Chocolate Chunk Cookies. 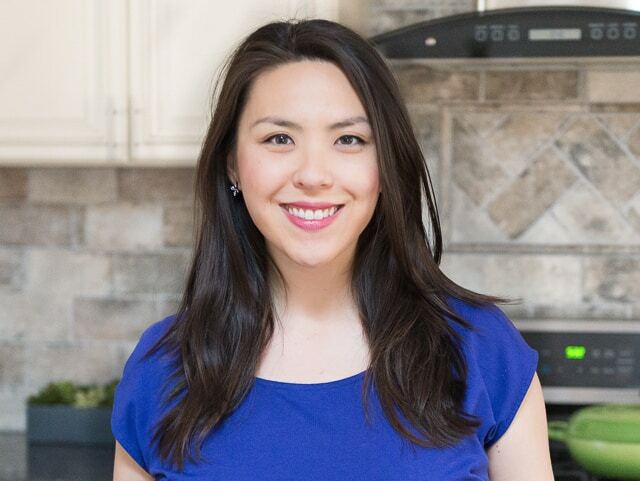 You can see all of my cookie recipes in my Cookie Recipes section of my Recipe Index. Happy baking! 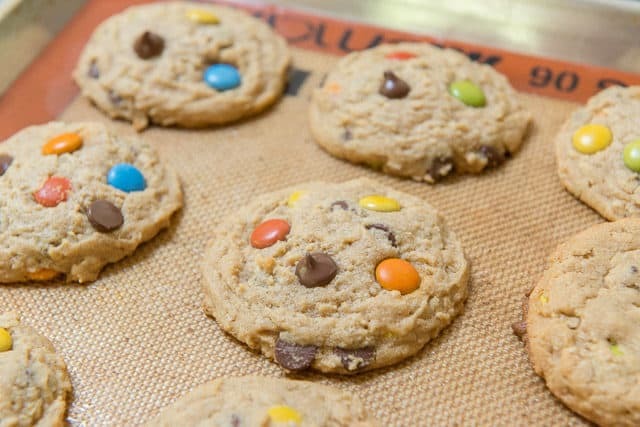 Monster Cookies combine many of the best cookies all into one! 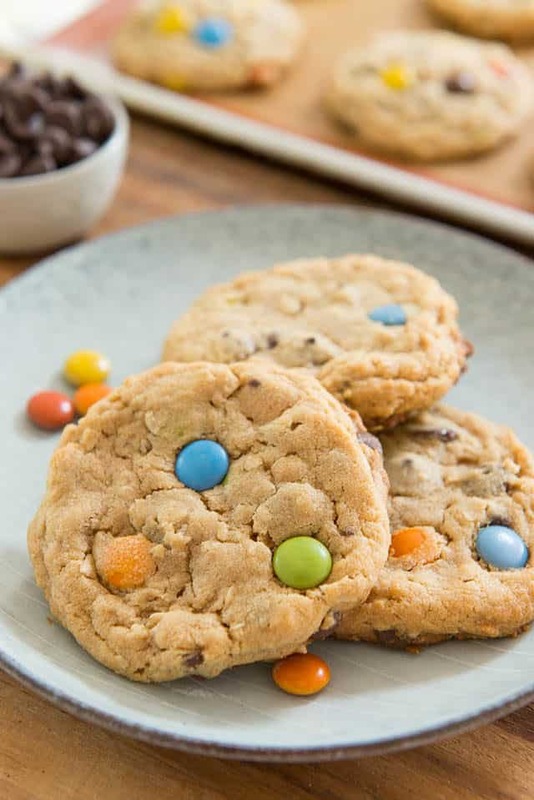 They're soft and chewy, with peanut butter, oatmeal, milk chocolate candies, and chocolate chips for a delicious treat. 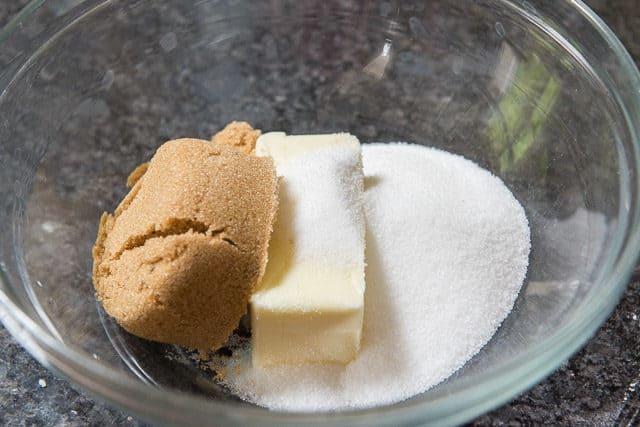 In a large bowl, cream together the butter, brown sugar, and sugar, for about a minute, until well combined. 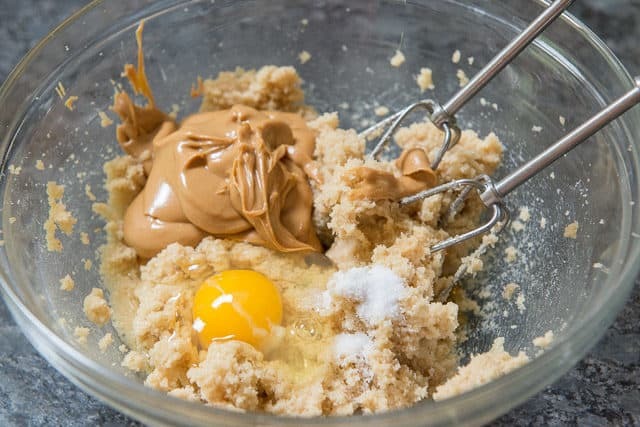 Add the peanut butter, egg, vanilla extract, and salt, and mix until smooth and combined. 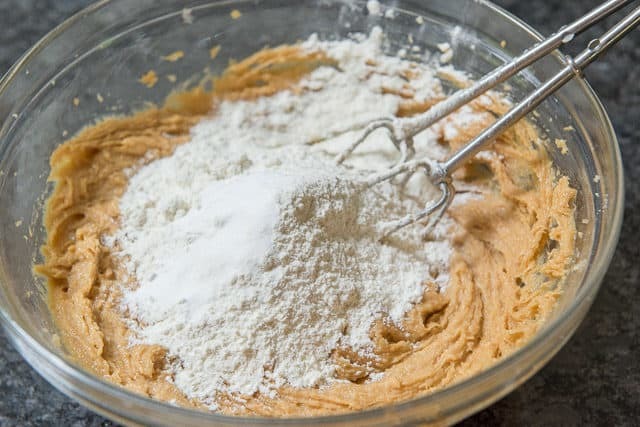 Add the flour and baking soda, and mix until the flour has almost disappeared. 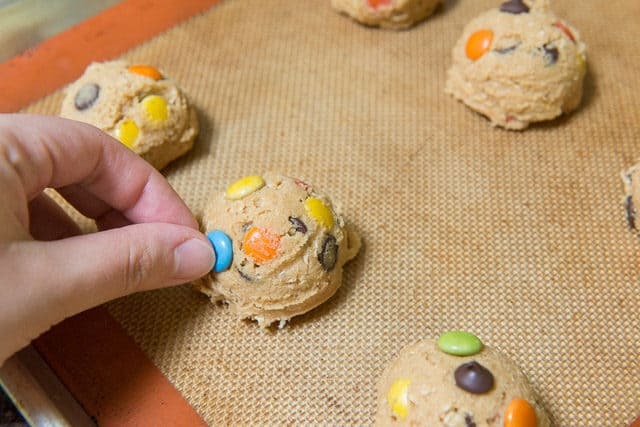 Add the chocolate chips, chocolate candies, and oats, and mix until evenly distributed and the flour has been incorporated. Do not overmix. 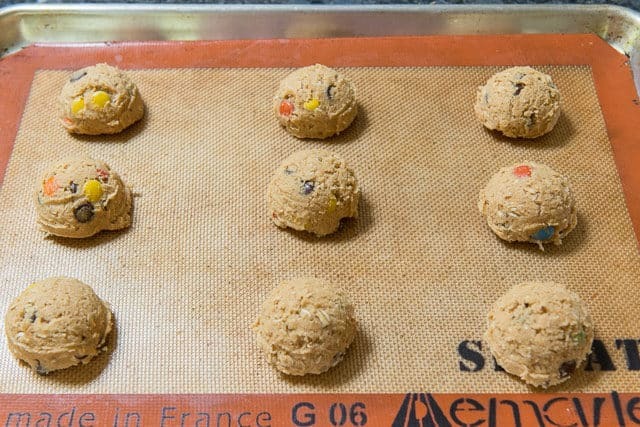 Use a #20 3T large cookie scoop to portion scoops out on a silicone mat lined or parchment paper lined baking sheet, 9 per half sheet pan (you will have two trays). Bake for 11-13 minutes, until the cookies are slightly golden on the edges, but still soft in the middle. You want to pull them just before they seem done, as they will continue to cook on the sheet pan as they cool. Let them cool on the pan, and you can enjoy them slightly warm or after they've cooled. Enjoy! *I use the creamy, spreadable peanut butter. Not the one with hydrogenated oil in it, but the ones where a touch of extra oil is added to give it a smooth texture. My guess is natural peanut butter would work just fine here too. **If you don't have quick cooking oats, you can pulse old fashioned oats in a food processor several times to cut them into smaller pieces. Note: this post and recipe was updated in June 2018, and it was originally published September 2011. Joanne–Thanks so much ! I had absolutely no idea ! And the most obvious reason–that different manufacturers add different amounts of salt to their butter–never occurred to me–DUH ! It all makes sense to me now, and I also learned –in addition to the salted vs unsalted question–that not all butter is the same, which I also did not know. I had previously thought that they were all interchangeable, and so I had always bought the cheapest one on sale. Thanks for the link ! Yum I’m looking for a good chocolate chip cookie recipe.